Myne Whitman will be meeting with fans and signing her new book, A Heart to Mend, at the Greater Seattle RWA Book fair along with other local authors. 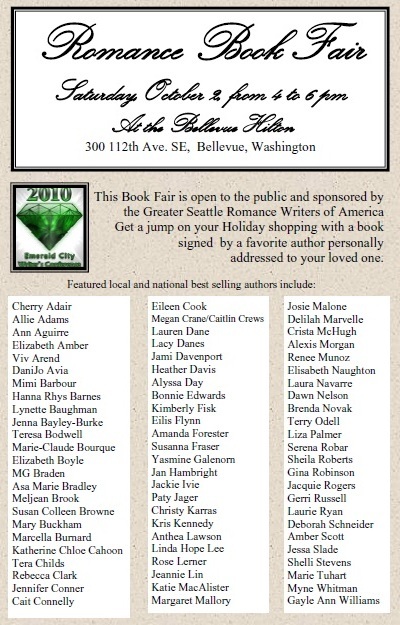 The Greater Seattle Romance Writers of America is sponsoring a Book Fair on October 2, 2010 at the Bellevue Hilton. The event runs from 4:30-6:00 pm in the Skyview Ballroom and includes signing opportunities with the more than fifty best selling and award winning authors listed below. This is a free event and open to the public. The Bellevue Hilton is located at 300 112th Avenue SE in Bellevue, Washington. Their phone number is 425-455-1300.